After a smooth flight from London, myself and half the group arrived at a hot Phoenix airport in the early afternoon. We then found Daniel and Laurette who had travelled from France and finally the rest of the group who had arrived from nearby States. Frank eventually got the vehicles sorted and we were soon heading out of the city and towards Tuscon. On the way we stopped at an area of fields at the Marana Pecan Grove, and here we soon started our list of Arizona birds. Several Gambel's Quails were seen running through the fields, Red-winged Blackbirds flew over along with Great-tailed Grackles, while on dead tree a Loggerhead Shrike was spotted, and nearby Alan found our first Burrowing Owl. A few more owls were found and we all enjoyed excellent views as they sat watching us. Then we had a nice Blue Grosbeak, Bullock's Oriole and lots of Mourning Doves, White-winged Doves and then a very showy Gambel's Quail sat on a tree calling. After this good start we headed for our motel and a well deserved meal and sleep. After breakfast we set off to a nearby super market to get a few supplies for the day. With this done we then drove to a small group of pools where we then made a quick search. Black-necked Stilts were found alongside several Killdeer and a Spotted Sandpiper. We had good views of a group of Cliff Swallows which included a single Tree Swallow. Mourning Doves were everywhere and lots of White-winged Doves were seen flying over. A nice looking Lark Sparrow was then spotted before we got to the final pool which was a little more remote and surrounded by reeds and scrub. Straight away our quarry was spotted by Frank, a lone Least Grebe and a good record for Arizona. We scoped it and although distant lots of different features were noted and explained. Moving on to our next site a roadside stop proved productive with excellent flight views of a Grey Hawk and then a Coopers Hawk, while amongst the trees and bushes we saw Phainopepla's, Blue Grosbeak,Northern Cardinal and a few of the group glimpsed an elusive Yellow-breasted Chat. Another roadside stop when a Swainson's Hawk was spotted, ended up with us finding several superb Black-throated Sparrows, a Yellow-billed Cuckoo, another Grey Hawk and a couple of smart looking Western Tanagers. Moving on we decided to have an early lunch before going into Aravaca Cienaga Park. Beside a small café we got superb views of a Hooded Oriole, two Cactus Wrens, a Roadrunner and several beautiful Broad-tailed Hummingbirds as well as some great Butterflies. After lunch we went into the park and took a walk through the scrub and out onto some board walks. A young Verdin was spotted first followed by a couple of nice lizards and then where it opened out we got our first Vermillion Flycatcher - what a beauty! Our local friend Jay gave his impression of a Gray Hawk calling and unbelievable a bird flew in and landed on a post for all of us to see. As we continued our walked around we found several Blue Grosbeaks, Summer Tanagers, a couple of Botteri's Sparrows, Common Yellowthroat, Dusky-capped Flycatchers and some Black Vultures amongst the much more familiar Turkey Vultures. A Yellow-breasted Chat then gave us excellent views, more Vermillion Flycatchers were spotted along with several Cassin's Kingbirds. Moving from the park we then made our way to California Gulch. It was looking like we were going to get a bit of rain but luckily it passed by. Walking down into the gulch it only took us a few stressful minutes at the bottom before we found our target bird the very localised Five-striped Sparrow - it was even watched singing as late as 6.15pm! We got some great views of two birds, and then we watched a Canyon Wren sat out in the open, while a couple of Varied Buntings were seen and as we made our way back up, a Northern Beardless Tyrannulet was heard and then showed well. From here we drove just a short distance to an open area where we took our food out of the vehicles and waited until dusk. There was no sight or sound of the Buff-collared Nightjar that we were looking for but we had a fantastic feast and were entertained by a magical lightening storm. Driving home turned out to be a real adventure as the rains that we missed had caused flash flooding elsewhere. We had to drive through many floods seeing a washed up vehicle and tons of rocks and rubble strewn across the roads. We eventually got back a lot later than anticipated but a great day was had by all! After breakfast we drove towards the Sonora Desert Museum. A quick stop along the way managed to get us views of a Gilded Flicker sat on top of a tall cactus and we also managed to find a pair of Black-tailed Gnatcatchers. Moving on we drove through some amazing desert scenery and soon arrived at the museum where another gnatcatcher and some Cactus Wrens were seen in the car park. Once inside we met the park rangers. It wasn't long before we found a few Pyrrhuloxia's, more Cactus Wrens and a very smart Hooded Oriole. Our main target bird here however was a hummingbird and positioning ourselves in an area where one had been seen, it wasn't long before a thin high pitched song drew us to a gorgeous male Costa's Hummingbird. We got excellent close views of this little gem seeing its iridescent purple throat shield as it turned into the light. A captive exhibition was then looked at by most of the group before we continued our walk around, seeing Bronzed Cowbird, lots of House Finches, Purple Martin, Northern Cardinal, more Hooded Orioles and three Warbling Vireos. There were also several nice lizards, Rock Squirrel and a variety of butterflies to be seen. A quick lunch was taken here before we drove to the nearby Snyder sewerage pools. It was pretty hot here but luckily it soon clouded over a little and we had some good birding. A Roadrunner was seen flying and then shortly after, a wily Coyote was spotted going in the same direction. Scanning through the many waders we found Black-necked Stilts, two American Avocets, Long-billed Dowitchers,Greater and Lesser Yellowlegs, and some Mexican Ducks. A Snowy Egret was also there and about six Wilson's Phalaropes as well as a small group of Killdeer. Walking on to the next pool we saw a couple of Common Ground Doves and then scanned through even more shorebirds, finding bigger numbers of Wilson's Phalaropes, Long-billed Dowitchers including a white aberrant bird, three Stilt Sandpipers, lots of Western, Least and a Spotted Sandpiper. Sifting through we also found some Baird's Sandpipers, and amongst the grasses on the bank were Lazuli Buntings and Blue Grosbeaks. It was now time to leave so we set off back though some great desert scenery to our next sewerage pools strangely called 'sweet water'! Here it wasn't long before we had an adult Harris Hawk in the scope and not long after, Bruce spotted a closer juvenile bird - so close in fact that Daniel had just its head in his scope. Around a small pond we struggled again with Verdin, but a nice Yellow Warbler was spotted. Our next stop was under a road bridge where we got superb views of a Barn Owl on its daytime roost. From here we then drove to Agua Caliente and took a short walk. Verdins were still proving frustrating to everyone, but on a small lake we found four Ring-necked Ducks, a Green Heron showed well as did Great Blue Heron, Dusky-capped Flycatcher, Gila Woodpeckers, Lesser Goldfinches and then just before we left we had great views of a family of Verdin - at last! We then drove to our next motel where we were to stay for the next three nights. After breakfast we headed up towards Madera Canyon. On the way up several roadside stops were made as we searched the scrub and grasslands. With lots of birds singing and giving their song-flights we soon found some of our target species such as Cassin's, Rufous-winged, and Rufous-crowned Sparrows as well as Curve-billed Thrashers, Black-throated Sparrows, Blue Grosbeaks a distant Scott's Oriole and a Swainson's Hawk. Further up the valley our next stop was at the Santa Rita Lodge. Our first Mexican Jays were easily found and then concentrating on the feeders here we soon added great views of Lesser Goldfinches, White-breasted Nuthatches and some stunning Acorn Woodpeckers. Then further up the valley we made another roadside stop in a richly wooded area beside some houses with feeders. On the these feeders we saw a Blue-throated, Anna's and Magnificent Hummingbird and then in the woodlands amongst the hoards of Acorn Woodpeckers we found two Strickland's Woodpeckers, and then shortly after watching these very restricted birds we found a pair of Sulphur-bellied Flycatchers at their nest! Also in this little hot spot were a very confiding Canyon Wren, several Bridled Titmouse, Plumbeous Vireo and Black-headed Grosbeaks. We then drove to the top of the valley and set off on a walk in search of Elegant Trogan. As we followed the trail higher and higher we came across Greater Pewee and then a couple of very active Painted Redstarts flitting through the trees, shortly followed a bunch of birds that included Hermit Thrush, Hutton's and Bell's Vireo, Black-throated Grey Warbler, Grace's Warbler and a brief Brown Creeper. We never saw or heard a trogan so we were bound to return! On the way down we did find Canyon Towhee and a family group of Hepatic Tanagers. We then headed back down the valley for a late lunch after which we decided to visit the area of St Xaviour Mission. As we drove towards the mission the heavens opened up and we found ourselves in the most torrential rainstorm imaginable. As we arrived it was obvious there was no chance of birding so several of the group took their chances with the rain and lightning bolts to run across and have a look inside the mission. Having looked inside this spectacular building we returned to the vehicles and made a decision to return towards our hotel. What were previously roads were now rivers but we managed to get through and with no let up of the rain we called an end to the day. Reading the papers the next morning, the storm had made headlines as thousands of homes were left without electricity. We were up early today and headed for Patagonia Lake Park. On the way we had coffee stop and then further on Gina spotted a Black Bear and its cub from the highway but frustratingly it was impossible for us to stop! As we neared the lake entrance a couple of American Kestrels and a Blue Grosbeak were seen on wires, while at the gate a nice Say's Phoebe showed well. Once we had parked up we set off on a walk around the back of this large lake. At an overlook we found several Olivaceous and Double-crested Cormorants, Moorhen, Coots and a few Pied-billed Grebes. Moving on slightly we searched the trees and bushes and had good views of a couple of family groups of Yellow-breasted Chats, some Summer Tanagers, Bell's Vireo, Bridled Titmouse and the ever stunning Vermillion Flycatcher. The wetter areas also held Yellow Warblers and a few Common YellowthroatsAfter this we returned to the vehicles and then drove to a roadside stop where we had our picnic breakfast. No casual roadside stop, this area held a few special species. With breakfast over we soon located a pair of Thick-billed Kingbirds, we had excellent views of these as well as lots of Phainopepla's, Cassin's Kingbirds and a Yellow-billed Cuckoo. Across the road from here a Bobcat was seen by a few of the group and then we got views of another Arizona rarity as a male Rose-throated Becard was spotted. Latter we also saw the female and even watched them going to and from a their nest. A Violet-crowned Hummingbird proved to be a little more difficult to see. After this we drove to the Patten's house and here we made ourselves comfortable on their well organised gallery of seats underneath the shade of a gazebo. With the nectar feeders all numbered the constant call of so-and-so now on 4 or just come in to 2 made this a very laid back session of birding. Highlight here had to be the superb Violet-crowned Hummingbird, but they all looked good fluorescing in the sunlight and we enjoyed numerous Broad-billed's, Black-chinned and Anna's Hummingbirds as well as Abert's Towhee, Bronzed Cowbird, Lesser Goldfinch and even a pair of Gambel's Quail. After lunch in a quaint little town we drove to a nearby creek in search of a nesting raptor. We weren't in area long before a shrieking call drew us to a juvenile Zone-tailed Hawk sat in its nest. This bird looked fabulous but even better was the adult bird that flew in and landed nearby calling to the youngster. We finished off here by getting excellent views of a Rock Wren, singing from what else but a Rock! We then decided to return to Patagonia Lake Park where much the same species as the morning were found including this time Black-tailed Gnatcatcher and Western Wood Pewee. We also got good views of Ladder-backed Woodpecker and a flycatcher that could well have been a Pacific-slope Flycatcher, the problem being that it is impossible to tell apart from Cordilleran Flycatcher although the habitat, altitude and range fit better with the former. Leaving this area we next called in to a roadside pond were Frank had recently found a group of White-faced Ibis. Sure enough we were soon looking at a group of 20 ibis reflecting their colourful sheen in the sunlight. Also beside this tiny pool we saw several Black-bellied Whistling Ducks, an immature Black-crowned Night Heron, Tropical Kingbird and Lillian's Meadowlark. Returning back to our motel we had a great evening meal and then went out for a night drive up Madera Canyon. Bird wise it was very quiet but we did find a Colorado River Toad and a couple of very attractive Western Diamondback Rattlesnakes on the road. Today we went out early to re visit Madera Canyon. Along the way both Red-tailed and Swainson's Hawks were seen sat on telegraph poles. After a quick look at these we then continued right up to the top parking area. Within a minute or so of getting out of the vans and half way through our coffees which were very soon abandoned, we heard an Elegant Trogan calling just a short distance up the track. We walked a hundred yards and there we found two birds calling to each other - superb! Happy with this we then split the group as some wanted to go further up the canyon while a few others wanted to try and re-find the trogons, which had flown off downhill. The uphill group managed to find a mixed feeding flock which contained Painted Redstarts, Plumbeous and Hutton's Vireos, Dusky-capped and Sulphur-bellied Flycatchers, Black-throated Grey Warbler and the highlight which was two stunning Red-faced Warblers. As they returned back down a Zone-tailed Hawk was seen to fly over. 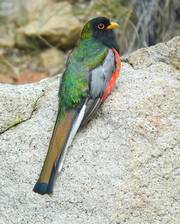 The down hill group searched the lower forest and got to see four or five Sulphur-bellied Flycatchers, an American Robin, a close Band-tailed Pigeon and also fantastic close views of two Elegant Trogons. In the car park they also saw up to forty White-throated Swifts circling the mountain top. When everyone had joined back together we all went for a short walk to have one final look at the trogons which were still showing very well. Leaving here we drove down the valley making a quick stop where we saw a Coopers Hawk perched, White-breasted Nuthatches and a superb Painted Redstart. At the bottom of the valley we had a late breakfast and then set off on our long journey to Portal. We started off by driving through Box Canyon where a few stops produced some nice species including a Varied Bunting and an all too brief Crissal Thrasher. Further on, as we came around a corner everyone jumped out of the vehicles as a pair of Golden Eagles circled low in front of us giving the most unbelievable views. Continuing our long journey we eventually came out into the San Raphael Grasslands a fabulous scenic expanse of grass stretching as far as the distant hills. We soon found our first Grasshopper Sparrows singing from small bushes while American Kestrels seemed to be fairly common here. As we took our lunch break we were treated to views of Swainson's Hawk, a Northern Harrier and lots of Eastern Meadowlarks - all of which were of the race known as Lilian's Meadowlark showing extensive white outer tail feathers. Gina then got to grips with some animal tracks in the mud and these turned out to be Grey Fox. As we continued on, several Lark Buntings were found, as well as Roadrunner, and then Lazuli Bunting, Western Tanager, Curve-billed Thrasher, Say's Phoebe and Western Kingbirds. As we drove out of the grasslands being hotly pursued by a thunderstorm we climbed up into the mountains, where a lookout gave us some spectacular views, before we continued down the other side to the town of Bisbee where we had something to eat and a drink. After this we continued our drive to the tiny town of Portal where we arrived tired and ready for a good nights sleep. Before breakfast we took a short walk around this tiny town with all its wonderful old buildings. A Violet-crowned Hummingbird was found on its nest, and in a garden full of feeders we waited patiently and saw a pair of Lazuli Buntings, Black-headed Grosbeaks, Black-chinned Hummingbirds and a female Rufous Hummingbird. A Montezuma's Quail was then heard calling twice and some Gambel's Quail walked across the road. We also saw Western Wood Pewee and some White-breasted Nuthatches before returning for breakfast. Afterwards we drove up into the mountains stopping on occasions when we heard birds calling. Several flocks we came across held one of our target birds the Olive Warbler, as well as Grace's and Hermit Warblers, Red-breasted Nuthatch, lots of noisy Bushtit's, plenty of Rufous Hummingbirds and a perched juvenile Swainson's Hawk. We also managed to find Yellow-eyed Juncos, groups of Pygmy Nuthatch and a Hairy Woodpecker. It then started to rain hard so we drove back down the canyon, out of the rain and stopped at a house which had several feeders. Here we were invited to sit in the gardens and eat our picnic lunch. 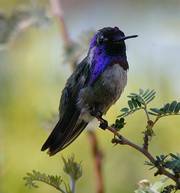 On the nectar feeders we watched a Broad-tailed Hummingbird as well as Blue-throated and Magnificent. This was the place to see Juniper Titmouse and we weren't to be disappointed as several came to the feeders and showed well. As we watched these, Alan then spotted a pair of Montezuma's Quail coming out onto the open track, what a good find and what superb birds these were. Eventually everyone saw them before they moved off into the woods. We finished in the garden by seeing several Spotted Towhee's and lots of Mexican Jays. Moving on to our next stop which was a cemetery in the middle of nowhere we found a flock of Lark and Chipping Sparrows and then after a bit of a cat and mouse chase we got to see a Grey Flycatcher. Heading back towards our lodge a final stop beside a cactus strewn hillside found us a couple of Scott's Orioles and eventually good views of Black-chinned Sparrow. After our evening meal and a short stroll we saw two young and then an adult Great Horned Owl a wonderful end to the day. Before breakfast we took a short drive to a 'wash' which looks like a dried up river but is caused by flash flood water from the mountains. Walking around here we found several Curve-billed Thrashers, a group of Bushtits, Canyon Towhees and a couple of Chihuahuan Ravens. We then needed to get fuel for the vehicles so we drove to the small town of Rodeo. Stopping in a desert area just before the town we conducted a thorough scan and eventually got excellent views of two Bendire's Thrashers as well as a Roadrunner, Western Tanager and a Lark Bunting. After breakfast we headed back into the mountains and drove to Rustler Park. Several flocks of birds were found and amongst these we saw over twenty Pygmy Nuthatches, it was just incredible. Amongst the warblers, we got excellent views of two Olive, ten Grace's, up to six Hermit's and three Virginia's. Several Mexican Chickadee's were also seen along with Red-shafted Flicker and family groups of Yellow-eyed Juncos. Returning to our lodge for lunch we later took a walk through the village to the back yard of a house situated at the far end. Watching the feeders and the ants around our feet we got to see Broad-billed, Black-chinned, Rufous, Blue-throated and Magnificent Hummingbirds and in the dead trees we watched a couple of Acorn Woodpeckers. After this we took a drive to Cave Creek where we set off on a walk along the stream and through the woods. We had a great time in this very picturesque canyon where we saw a good selection of species even though it was generally very quiet. Returning to the vehicles at dusk and seeing the sun set wonderfully on the pinnacle rocks we then returned to our lodge. This morning we had to leave early so we took our breakfast with us and drove to Barfoot. Once we arrived at our stop high in the mountains we tucked into our breakfast while keeping an eye on the nearby hillside. Mercier then caught site of our target bird circling up on the horizon, it was an adult Short-tailed Hawk which we all watched in flight and then perched on a distant tree. Amazingly on our last tour two years ago we spotted a Short-tailed Hawk in this area. 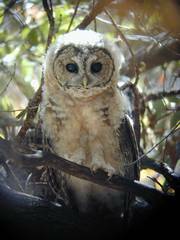 It was reported to the Arizona rare bird alert as there had not been any records for the state for several years - now there nesting!! With this success under our belts we then drove towards Monument Park. Along the way we spotted a Montezuma's Quail on the roadside and in an area of woodland we found several Steller's Jays. The park was superb for scenery with amazing rock formation and several excellent lookouts. There were a few nice birds here but it was the scenic spectacle that really captured us all. On then to Willcox lakes which was in fact a sewerage works. On arrival here we first spotted a Scaled Quail which showed very well and perched on a log for us. Looking over the first pool we saw a White-faced Ibis and together with three Ring-billed Gulls was a Franklin's Gull. Moving around we had great fun sorting through the many shorebirds present. Amongst these were Black-necked Stilts, American Avocets, 44 Long-billed Curlews, Long-billed Dowitcher, Killdeer, Semi-palmated Plovers, Greater and Lesser Yellowlegs, Spotted Sandpiper, Western, Least and 12 Baird's Sandpipers and finally 24 Wilson's Phalaropes. There were a few duck also present and we found Lesser and Greater Scaup plus a few Ruddy Ducks. A Peregrine Falcon was then seen flying past and on another small reed fringed pool we found American Wigeon, Shoveler and Cinnamon Teal as well as a few Yellow-headed Blackbirds and Bank Swallows. Next we drove on to St Davids where we had excellent views of a Grey Hawk soon followed by our target species two Mississippi Kites. Continuing our journey the next stop was for lunch and a little sightseeing at the famous Boot Hill graveyard and Tombstone. Leaving the cowboys and Wild West behind us we then drove to the Karchener Caverns. These amazing caverns with there twenty types of rock formations including the spectacular huge central column was a real treat and a diversion from birding at a time of day when very little wildlife was active because of the heat. From here we then drove to Ash Canyon and a house with many hummingbird feeders in the gardens. What a superb spot this was and we got excellent views of many species including a male Costa's, 6 Anna's, Black-chinned, Magnificent, Broad-tailed, Broad-billed, Rufous and finally a superb male Lucifer Hummingbird. In the trees that backed the garden we found two Wild Turkeys while the regular assortment of feeder birds included House Finches, Lesser Goldfinches, White-breasted Nuthatch, Mexican Jay and a few dove species. As we were leaving the distinctive call of a Common Nighthawk drew our attention while two Lesser Nighthawks were also seen for comparison. After breakfast we headed up Miller Canyon to Beatty's feeders seeing a couple of White-tailed Deer along the way. Seated under cover we watched the public feeders surrounding the house. Here we saw lots of Black-chinned, Anna's and Rufous Hummingbirds as well as a very nice Blue-throated. From here we went up to the private feeders and patiently we sat down and waited. Many Anna's, Black-chinned, Rufous and Broad-tailed Hummers were seen, as well as a Magnificent and a female Calliope before we all got to look at a superb bright male White-eared Hummingbird. We then decided to go for a walk up the canyon. After a long hike we were successful in finding up to six stunning Red-faced Warblers, Hairy Woodpecker, a singing Plumbeous Vireo, Canyon Wren, Hermit Thrush several Hepatic Tanagers, Western Tanager and down by our feet a superb and seldom seen and probably very poisonous Rock Rattlesnake. Nina then uncovered a tiny Scorpion for us to look at and as we made our way back we were treated to several species of butterfly seen including, Arizona Sister, Morning Cloak, Two-tailed Swallowtail, and group of Azure's? Leaving here we drove to town and had a lunch stop at an old fifties style dinner, after which we continued on to the San Pedro House. Here we walked across some grassy fields and then along the river where we found a Swainson's Hawk, and a lot of birds coming down to drink in a small stream. We watched Abbot's Towhee, Common Yellowthroats, Summer Tanagers, Song Sparrows, Blue Grosbeaks and Western Wood Pewee and then moving along we found Vermillion Flycatchers, a Yellow-billed Cuckoo an amazing Box Turtle, Red Spotted Toad and another species of toad, as well as a large fat Garter Snake. A great end to the day we returned to our motel and our evening meal. After breakfast we drove to Garden Canyon. We had to pass through the military checkpoint before continuing up into this picturesque area. A stop half way up beside a picnic ground had us walk through the woods seeing several Western Wood Pewees and hearing a Montezuma's Quail. Beside the road we found a very obliging Lucy's Warbler, and we then heard an Elegant Trogon. Much further up the canyon we set off on a pleasant walk but we found it to be rather quiet. A couple of very attractive Buff-breasted Flycatchers were seen well but our highlight of the walk was a superb and locally rare Rattlesnake. There was a great selection of beautiful butterflies to be seen including Arizona Sisters and a Juniper ? and later on a Golden Eagle was watched flying over. Driving back a short distance we parked and then took a hike into Sheelite Canyon. Our target bird took a bit of finding but eventually we located a young Mountain Spotted Owl which gave us simply fantastic views. Returning back to the vehicle we then set off for lunch stopping to look at a close Coopers Hawk along the way. After lunch we drove to a sewerage farm. A platform enabled us to view a distant pool and large areas of reeds. A few waders were seen as well as Lazuli Buntings and a couple of Yellow-headed Blackbirds. To end the day we drove back to the "house of hummers" in Ash Canyon. Another very relaxed few hours of birding included highlights such as male Calliope, Costa's, and Lucifer Hummingbirds plus of course many more. Returning to our hotel we had our evening meal and then we went out for a little night watch. In a remote lane leading up into a canyon we were treated excellent views of both Western and Whiskered Screech Owls - simply superb! Today we were up early so as to visit French Joe Canyon before the sun got too hot. After a long and bumpy ride with stops to look at Black-throated Sparrows, and a Gambel's Quail we eventually arrived at the parking place. From here we had an hours hike up the canyon until we eventually reached a dried up waterfall. Along the way we saw two young Coopers Hawks and a singing Botteri's Sparrow. As we arrived at the waterfall area we immediately found a Rufous-capped Warbler sat out in the open, it unfortunately then worked its way into thicker cover and not everyone in the group saw it. We waited and searched but never found it again. A Cordilleran Flycatcher showed well and on our return back down the canyon we saw a great looking Collared Lizard. As we drove out of the canyon in the lower desert a quick stop to check out a thrasher on a distant tree was timed well as a Common Poorwill was flushed, we then searched the area and found another which showed exceedingly well. Leaving here we continued our journey towards Tuscon and then north to Sedona. A stop at the Sweetwater Sewerage Ponds found us Ruddy Ducks, Coopers and Harris Hawk, Killdeer, Least Sandpiper and Abert's Towhee. We then continued on seeing Collared Doves at a short stop. Eventually arriving at Sedona we found time to drive up to a watch-point where we enjoyed the glorious sunset over the red mountains before going to our favourite Mexican restaurant. of the Canyon we did find a couple of Zone-tailed Hawks, some excellent views of White-throated Swifts, a Rock Wren and a very confiding Brewer's Sparrow. At the end of the day we found it very hard to leave this wonderful area as every minute that passed saw the setting sun produce every more perfect photos! With an evening meal taken at an "Indian restaurant" we arrived back late but very satisfied at out hotel. Our last day of birding had us visit the San Francisco Peak. The long winding road that leads to the top is always worth a stop or two and once again it proved its worth when we found two Williamson's Sapsuckers, two Three-toed Woodpeckers and up to eight Townsend's Solitaire's. At the top of the mountain from the car park we took the chair lift that slowly transported us all the way to the very top. We saw several Clark's Nutcrackers along the way and then finally at the top we were told there was a storm coming and we could not walk the trail but would have to return back to the car park and café. While we waited we did find a bunch of Audubon's Warblers and a very bright Brown Crested Flycatcher. Then as we returned down we spotted an Olive-sided Flycatcher on a tree top. From the café we decided to walk back up the mountain a short distance as there were a few birds noticed in the woods as we passed over. It was O.K until it started raining! But our prize for getting wet was excellent views of a family of Green-tailed Towhees. We tried another area further down because it wasn't raining and in an open area with scattered bushes we found a couple of Orange-crowned Warblers, Spotted Towhee, six Vesper Sparrows and lots of Western Bluebirds. A final stop on our way back to the motel got us Brewers Blackbirds, Pine Siskin, American Robin and a Sharp-shinned Hawk. We then returned to our motel for our final evening meal. We left early and headed back to Phoenix in time for our flights back to our respective parts of the world. Having said our goodbyes to a wonderful group of people at the airport, a superb tour came to its conclusion.